Colorado Springs is such an amazing place that it’s one of the few we’ve come across that we’d consider using as a home base once we trade in the RV. There’s a vibrant small city, close proximity to Denver, stunning parks, and access to some of the best outdoor activities and scenic beauty anywhere in the world. It is also one of those areas that decided it can charge tourists exorbitant prices for things that are free most everywhere else. We skipped Seven Falls because . . . really? . . . $9.25 to see a scraggly waterfall. That’s precisely $9.25 more than we paid to see Niagara and dozens of other awesome waterfalls. It’s also $9.25 more than we paid to see Helen Hunt Falls a mere ten minute drive from Seven Falls. 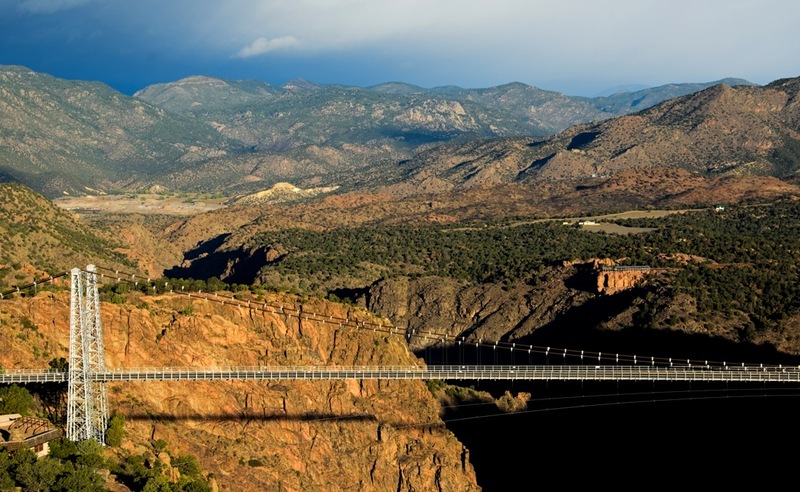 Then there is Royal Gorge Bridge, the highest suspension bridge in the world. We’ve traveled over hundreds of bridges, not all as pretty as Royal Gorge, but none of them were as expensive either. A trip across Royal Gorge sets you back $18.25 per person. That’s the price for off-season tickets. San Francisco’s Golden Gate Bridge charges less than a third as much, six bucks per car. True, Royal Gorge mucked up the area with other “attractions” like a pathetic petting zoo and some carnival rides. I suppose some might see these things as adding value worth paying for, but apparently the park doesn’t. They only offer a discount of a couple dollars for people arriving early to see the bridge when all of the other “attractions” are closed. 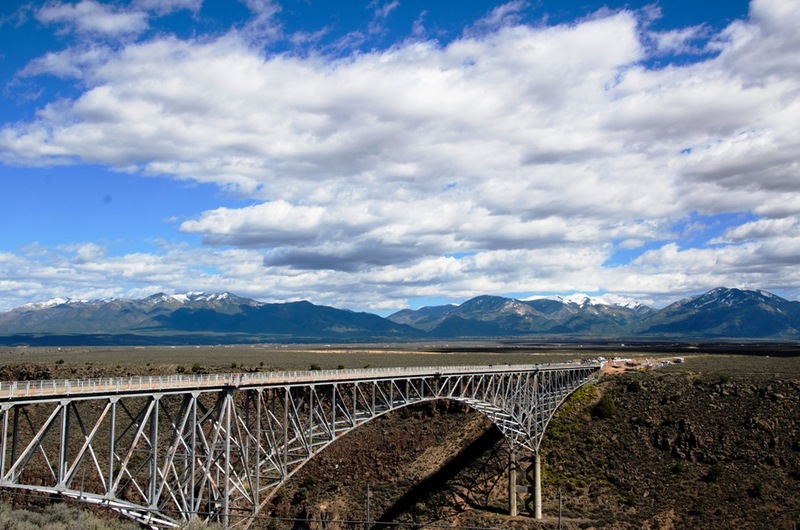 Rio Grande Gorge Bridge, meanwhile, is only the fifth highest in the U.S., but charges the right price. It’s free. I agree with you wholeheartedly about both. The falls and Royal Gorge are NOT worth the admission!!! My suggestion about Royal Gorge—-do a rafting trip on the river! A rafting trip down the Arkasas river through the gorge would be really cool. Something we should consider next time we’re in the area. As you point out, with a little bit of investigating you can often find other attractions close to whereever you are that are less expensive or free. I’ve been in New Orleans for a little over a week now and I’ve written 7 blog posts. The vast majority of the items I cover are free (jazz concerts, parks, art galleries, some museums), and in the case of some of the museums I visited, I got a special pass that covers multiple places for $10 bucks — rather than the $10 bucks each place wanted to charge for entry – for a total cost avoid of $20 bucks. As always, thanks for sharing your best tips Brian. You are building such a great set of resources for travelers! Thanks Carol. Enjoy NOLA – It’s one of our favorite US cities. Can’t wait to get back. That is what I call value added travel. I try to find free or inexpensive sites near home as well. New Orleans is on my bucket list. Thanks! I agree, we skipped both 3 years ago when we where there. Seven Falls use to be free. We saw it then and it was neat, but not something that I would pay for. Garden of the God is beautiful and free. Agree 100% on Garden of the Gods. Awesome and free. looks like a great place! I love mountains! So beautiful! I agree, they should be free; unless you are paying to cross the bridge to get somewhere you want to access; even then $5 should do it. It’s not really a bridge that is used for traffic. It’s mostly just a tourist attraction. LOVE the Rio Grande Bridge and I loved traveling the Astoria bridge crossing the Columbia from Oregon to Washington. It is amazing how they charge for everything now. I don’t blame you for skipping the $18 a person price tag. Crazy! 2 years in a row we have spent a portion of my son’s spring break in The Smoky Mountains National Park partly because it is within a 6-7 hour drive and partly because its completely free. Of course most people end up hanging out and spending all of their money in Gatlinburg (tourist trap). I have never understood this. A beautiful mountain full of hiking trails for free or another Ripley’s museum for $? who knows how much? We had planned a day hiking in the Black Hills of SD. We drove an hour before we hit the gates of Custer State Park that charges $15 (I think) admission. We didn’t know that the hiking trail was in the park, and weren’t going to pay for a day hike, so we turned around. Bummer. Later in the trip, we did end up staying at Custer. The park is well worth the price of admission. But not for a single hike. The time to go to the Seven Falls is during the Christmas holidays in the evening. It is free at that time every year. I believe the dates this year are 18 to 30 December from 5:30 pm to 9 pm. Good tip. That’s kind of like museums that offer free nights. It’d be nice if they had that a little more regularly; otherwise you have to hit it just right, or live in the area.